Text of Prof. Pathmanathan's paper presented at the First International Conference Seminar on Skanda-Murukan in Chennai, Dec. 28-30, 1998. This article first appeared in the September 1999 issue of The Journal of the Institute of Asian Studies. Among the temples dedicated to the worship of Skanda-Murukan in Sri Lanka the one at Kataragama is one of the oldest and certainly the most venerated one. According to tradition its origins are pre-Christian: King Duttagamani is said to have rebuilt and richly endowed the temple at Kataragama as a thanks-offering for the favour of the god, which enabled him to march against the Tamil King Elara and, after vanquishing him in battle, secure the throne at Anuradhapura (1981: 117).1 This claim, however, is not attested by archaeological evidence. Among the extant sources the earliest reference to the shrine of Skanda at Kataragama is to be found in the Jinakalamali, a Siamese Pali Buddhist text of the 16th century.2Arunakirinatar, who composed a large number of devotional hymns of exceptional poetic merit on Murukan during the 15th century, sang verses in praise of Murukan enshrined at Kataragama, whom he describes as the Perumal of Katirkamam. Thus it would appear that by the 15th century the temple at Katirkamam had developed as a centre of pilgrimage and a principal centre of the cult of Skanda-Murukan. 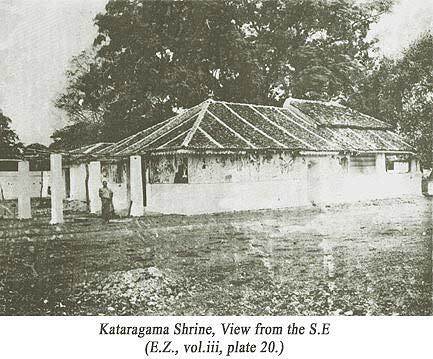 An authentic description of the temple at Kataragama and its surroundings as found in the second decade of the 19th century is found in Davy's account of Ceylon.5 The temple was found in the midst of a desolate country approached by a bare and sandy tract across jungle-covered territory. There were only few inhabitants in the surrounding area, who were found to be in an impoverished condition. Kataragama was by then a place of considerable celebrity on account of its temple which attracted pilgrims, not only from every part of Sri Lanka, but even from remote parts of the Indian sub-continent. Besides the main temple dedicated to the God of Kataragama there were many others, all of them small and mean buildings within two adjoining enclosures. In the largest square were found the Kataragama Devale and the Ganesa Devale; a vihare dedicated to the Buddha, in a state of neglect, and a bo-tree; and six very small shrines, which were dedicated to the goddess Pattini and to five other deities. In the small square were contained a little shrine dedicated to Siva, a kovil dedicated to Bhairava, a rest house for pilgrims, and some offices. The Kataragama Devale consisted of two apartments, of which the outer one only was accessible. Its walls were ornamented with figures of different gods and historical paintings executed in the usual style. Its ceiling was found to be a mystically painted cloth. In the surrounding country there were a few villages which belonged to the temple, whose inhabitants were found to perform services for the lands which they held. The officers of the temple, besides the brahmin priests, were a Basnayaka Nilame, who had the superintendence of the temporal concerns of the establishment under the control of the Government Agent and twelve kapuralas, who performed duties in turns.7 Before the British took possession of the country in 1815, Kataragama was visited by pilgrims in large numbers but subsequently their numbers had diminished and the buildings were in a state of decay and neglect. 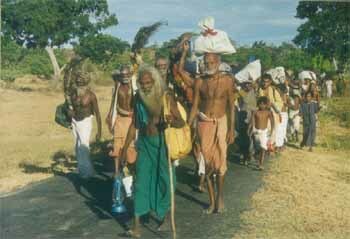 Kataragama Pada Yatra foot pilgrims. During the course of the 19th century Kataragama was deserted except during the annual festival which was conducted during the new-moon of July and lasted a fortnight. During this period the Basnayake Nilame and other temple officials take the casket of the god in procession for fourteen successive nights in the customary fashion on an elephant's back with chamaras, lamps and flamebeauxs. The last and the grandest perahera is on the last night and is followed by the "Water-cutting" ceremony in the Menik Ganga. 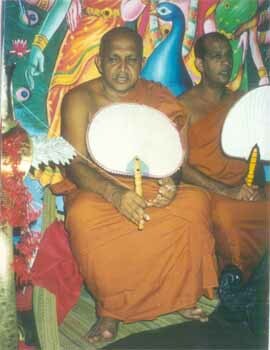 It would appear that until recent times pilgrimages to Kataragama were undertaken during the annual festival. As Kataragama was in a part of the country infested with malaria and pestilential fever the annual festival had been a source of epidemic disease. Often the pilgrims who congregated at this isolated site underwent a great deal of hardship on account of scarcity of water as the Menik Ganga, the only source of supply, dried up during the dry season. In the last quarter of the 19th century the government initiated action to provide some basic facilities for the pilgrims congregating at the site during the period of the festival. Arrangements were made for putting up some huts and for the provision of magisterial supervision, medical attendance, police guards etc. Since these steps were taken there was a steady increase in the numbers of pilgrims. Their number which was 2,000 in 1871 had risen to 5,000 in 1872 and in 1873 it was found to be in the region of 7,000 - 8,000.8 Thereafter, there was a phenomenal increase in numbers basically on account of three considerations: the improvement of sanitation facilities, the development of communications in the country and the presence of a large Tamil population in the plantations districts. Kataragama is perhaps unique as a meeting place of two closely connected, yet separate religious traditions, Buddhism and Hinduism, which had co-existed and closely interacted over a period of two thousand years. As the centre of a cult and pilgrimage it is held in deep veneration and visited by both Hindus and Buddhists. Another interesting feature about Kataragama is its close association with the Veddahs in legend and mythology. The Veddahs, one of the native communities inhabiting the island, were in the habit of visiting Kataragama and offering worship according to their own customs. In the Hindu tradition Kataragama is the oldest and most sacred centre of the cult of Skanda/Murukan in the island. A connection with Katirkamam is claimed in the traditions relating to the foundation of the temples dedicated to Skanda/Murukan in the Northern and Eastern parts of the island, and particularly the shrines where worship is conducted without reference to Agamic traditions. In the Tamil Hindu tradition, Valli the junior consort of Murukan, was the offspring of a Veddah chieftain holding sway over territories surrounding Katirkamam, which became the permanent and favourite abode of Skanda/Murukan after he had vanquished Curapanman and his host of warriors, who exemplified the forces of evil. The legend had its origins in antiquity and was perhaps inspired by the close association of the tribes of huntsmen who roamed the jungles, with the cult of Murukan. Kapurala-priests accompany the stealthy Kataragama god on His nightly procession at Kataragama. The worship conducted at the central shrine, which is dedicated to Karttikeya or Kantakumara, is aniconic and non-agamic. There is no image of the deity in the sanctum, which is always closed and covered by a curtain. During the annual festival a casket, is carried on the back of a decorated elephant in procession. The worship is conducted by a kapurala and his associates, whose claims to specific roles are determined by custom and based on the principle of hereditary succession. They cannot be dismissed or dislodged by the communities of devotees or by any political authority save under exceptional circumstances. The casket carried on the back of an elephant in festival procession and the engagement of priests called kapurala are two elements suggesting close affinities with the traditions of the devales of Sinhalese Buddhism. In fact the central shrine at Kataragama is traditionally referred to as a devale. The existence of the bo-tree and a Buddhist temple in the neighborhood clearly suggest the close association of the Kataragama devale with Buddhism, an association which has come down since early medieval times and has survived until now. The cult of Murukan is popular among all classes of Hindus in Sri Lanka and there are hundreds of shrines dedicated to him in many parts of the island. Most of these shrines are found in the Northern and Eastern Provinces where the Hindu population has been concentrated in historical times. Some of them are of great antiquity while the others are relatively of recent origin. Significantly the foundation myths pertaining to some of these shrines presuppose a connection with Katirkamam. The temples are Nallur, Mavattapuram, and Celvaccanniti in Jaffna are perhaps the oldest and certainly the most important temples dedicated to Murukan in the entire Northern Province. The design of the temple and the worship conducted at Celvaccannati are not in the agamic tradition. There is no icon in the sanctum and the deity is represented symbolically by the Vel-spear as at the Kantacuvami temple at Nallur. The temples of Verukal, Cittanti and Tirukkovil in the eastern part of the island are of great antiquity and according to tradition the Veddahs visited these shrines in large numbers and mingled with the Saivite Tamils in conducting the annual festivals.10 The concept of tiruppataikkoyil that was developed in Mattakkalappu Tecam presupposes a close connection with the temples of Murukan in that region and the shrine at Kataragama.11 In this context the tradition that the temples of Murukan in the eastern part of the country were established by Cettis, a class of traders who went on pilgrimage to Kataragama, is significant in providing some hints about the character of their origin and development. 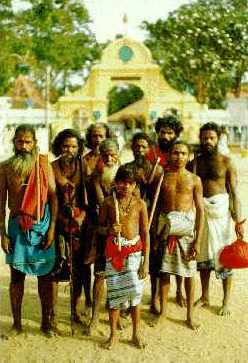 The pilgrimages to Katirkamam undertaken by devotees down through the centuries from the eastern littoral facilitated the development of a unified and integrated tradition pertaining to the cult of Murukan in that region. There, Katirkamam was reckoned as one of the seven tecattukkoyilkal (national centres of pilgrimage) until recent times. A survey and scrutiny of the traditions pertaining to the cult of Murukan and the principal centres associated with it clearly suggest that Katirkamam was the most venerated of the shrines of Skanda/Murukan and reckoned as the centre of the cult. It was doubtless pre-eminent among them and it had gained recognition as a shrine of national importance while others were only of local and regional significance. Personal names such as Katirecan, Katirkamam and Katiramalai which were and still are common among Saivite Tamils in Sri Lanka provide an indication of their feelings of emotional attachment to Katirkamam. There is a substantial body of literature consisting of devotional hymns, talapuranam and several varieties of the class of pirapantam in Tamil, on Katirkamam.12 Most of these have not yet been critically edited and evaluated and until this work is accomplished only tentative formulations can be made about the origin and development of the myths, traditions and ideology pertaining to Katirkamam. In the Tiruppukal of Arunakirinatar there are sixteen verses on Katirkamam and in these verses the author had co-ordinated the principal myths, traditions and tenets pertaining to the cult of Skanda/Murukan as known to him. Katirkamam was found to be a sacred site of great antiquity (Katirkama mutur).14 As a centre of the cult of Murukan it attained celebrity and devotees are said to have proceeded there after visiting shrines at several other sites. As Arunakirinatar describes Murukan as the God residing at the mount of Katirkamam, it may be assumed that Katiramalai was venerated as a sacred site during his time. It is significant that when the Tiruppukal were composed the tradition was that Murukan was residing on the hill with the maiden of the tribe of vetar (verpil ariya veticci kalavikur cittira manikka vativane) as his consort. In the Tiruppukal, Murukan is described as the son of Siva (arakara civaya campu kuruparakumara). The Lord of Katirkamam is referred by the names Kumarapperumal, Tevarperumal, Virapperumal, Kurunatapperumal and Katirkamapperumal.15 Arunakirinatar projects him as the Supreme Lord who is both the source and the ultimate goal of devotion. He is the fountain of grace, the one who cares for the poor (elaikku irankum perumal) and the Lord of Justice (nitip-perumal). Murukan, who has his abode at Katirkamam according to the Tiruppukal, is the companion, the teacher and the ultimate goal. He is the companion in distress, the guardian against evil, the healer of disease and pain. To the devotee and to the seeker he provides all the requirements of comfort; he is the source of knowledge and eternal bliss. All the attributes of transcendence are conceived in relation to Murukan. He is principally the manifestation of Siva, the universal Spirit, and in that form the guardian of the cosmic order as suggested by puranic myths and yet accessible to devotees of all classes on whom he showers his blessings which assume the form of gifts, protection, enlightenment and ultimate bliss. It is in such terms that the God of Kataragama was perceived by Hindu pilgrims in the days of Arunakirinatar. It would appear that the cult of Murukan as a religious tradition provided an alternative to the ideology based on the agamas perpetuated by means of rituals and scholasticism. It represented a system of beliefs and conceptions which in their appeal transcended ethnic, sectarian and class barriers. Katirkamam, on account of its natural surroundings and the traditions concerning its origins and development became the favourite resort of pilgrims of all classes who could mingle and worship freely without restrictions and on a footing of equality. 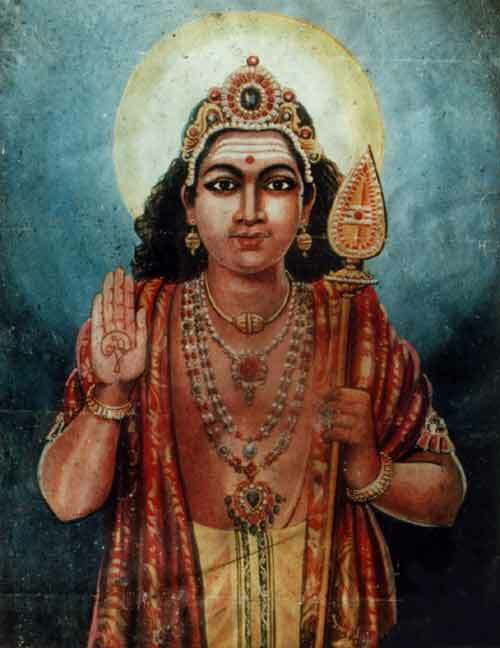 Arunakirinatar probably had perceived this unique character of Katirkamam when he described the Perumal of Katirkamam as the "Lord who is ever merciful towards the poor" and as "the Lord of Justice". The Katiraimalaip-pallu, a sixteenth century text written in a Vanni principality of Jaffnapatnam, is dedicated to the God of Katiramalai.16 Pallu is a poetic form employed in the description of the life of the Pallar, a class of agricultural labourers attached to farms and land-holders in bonded service. The poem concerned assumes the form of a dialogue between two women who were the co-wives of a certain individual. One of them is said to be a native of Ilankai while the other one was born in India. Each of them is engaged in the competition of glorifying the country of her birth. In the description of Lanka, Katirkamam is accorded the foremost position among sacred sites, the other being Tirukonam and Tirukketisvaram. Katirkamam is referred to in this text by the names Katirai and Katirapuri.17 The god of Katirai is referred to as Tenkatiraivelan, "Velan residing at Katirai in the South", Murukan, Kantavel and Kumarecan. In the Katiramalaipallu the God of Katirkamam is invested with all the principal attributes of Skanda/Murukan. He is the son of Cankari (Cankari tarum putalvan), the consort of Valli (Vallinayakan), and Kumarecan who rides on the peacock with spread out plumes, which resides in the woods and parks (polilir tokai mayil ninrulavum vannavelan).18 It is said that the sparks of fire which emanated from the third eye of Siva assumed shape in the form of six babes at lake Saravana and on their union Skanda assumed a form that was of the colour of gold and endowed with six faces and twelve arms. He became the guardian god of the fourteen planes of existence. He vanquished Curan whose might even Virabhadra, who had chastised Takkan, the triple divinities, the gods and the leaders of the mighty Ganas could not withstand. After eliminating Curan who had reigned over the 1008 solar systems, Murukan released the celestial beings from captivity.19 The text concerned clearly echoes all the principal elements of the tenets and myths in the tradition epitomized in the Kantapuranam. It is also significant that the Lord of Katirai is described as a beneficent God who showers grace on those who seek him. It is thus clear that by the sixteenth century the God of Katirkamam was identified as Skanda-Murukan and that his temple there was reckoned as the principal centre of his cult in the island. "After having split the Kraunca mountain and Tarukan with the vel as his weapon, Murukan, the supreme Lord, reached Devagiri and from there proceeded on a visit to Tirucceynalur and other sacred sites. Subsequently, on hearing in detail from the Lord of Jupiter about the activities of Curan and his younger brothers, he set off to Katirkamam with a following of countless warriors led by Viravaku-tevar and hordes of bhutas and reached there. In the foregoing account the myth as found in the South Indian tradition has undergone a process of modification and elaboration. Here there is a redaction of the tradition made with a view to establish the sanctity of Katirkamam. The concept of pataivitu is extended so as to accommodate Katirkamam in the list of the most sacred shrines of the cult of Skanda-Murukan. Another interesting point that merits consideration here is the divergence of the Sri Lankan tradition from that of South India in respect of the locality where the betrothal of Murukan to Valli had taken place. According to the tradition recorded in the Kantapuranam, Vallimalai in Tontaimantalam was the venue for the event. The modification of the original Tamil tradition in this respect was made in the light of certain developments connected to the spread and development of the cult among several ethnic groups spread over a larger geographical area. 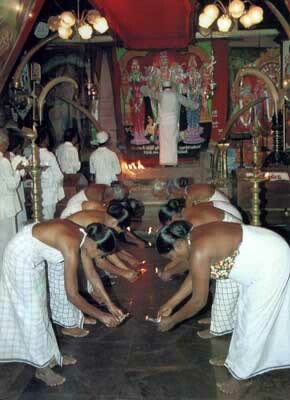 In the origin myths that developed in Sri Lanka one could perhaps discern the convergence of three divergent streams, the traditions of the Veddahs, the Tamils and the Sinhalese, and it would appear that the Daksinakailasa Mahatmiyam contains a synthetic form of the tradition with a pronouncedly Hindu elitist orientation. 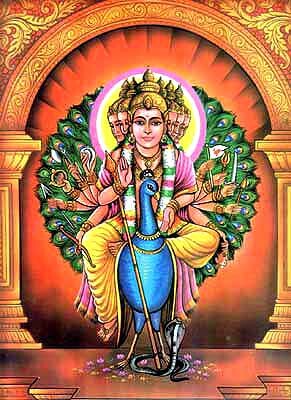 Skanda-Murukan entered the fold of Buddhism as one of the four guardian gods and it was in that capacity that he was established at the Kataragama devale which was originally attached to a Buddhist shrine that existed there. As there is no archaeological evidence of any kind at the site of the devale it is not possible to trace its origin and development before the fifteenth century. The shrine there was probably of very modest proportions and constructed with perishable materials. The inclusion of Skanda-Murukan into the company of the four-guardian gods and the provision for the accommodation of his devale within the premises of Buddhist temples seems to have resulted from the close interaction between Hinduism and Buddhism, which is exemplied at Kataragama in manifold ways. Skanda-Murukan as a deity was well known to the people of the island from pre-Christian times as suggested by the names Visakha and Kumara found in Brahmi inscriptions.28 The cult of Skanda seems to have exerted a strong influence on the royal court of Polonnaruva in the 11th and 12th centuries. The names Virabahu, Virapperumal and Parakramabahu which belonged to some of the princes suggest that Skanda was deeply venerated by members of the royal family.29 In fact Gajabahu II, as testified by an inscription, had conducted a laksapuja in honour of Skanda at the royal court and a certain Hinabi had made the image of the deity for this purpose. 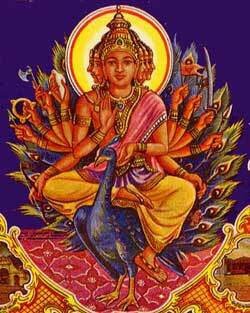 Skanda is referred to a guardian deity in inscriptions and chronicles since the 14th century. In one of the Lankatilaka inscriptions Upulvan, Saman, Vibhisana and Kantakumara are said to be the four god kings.30 The Lankatilaka and Gadaladeniya temples constructed during the mid-fourteenth century represent a distinctive phase in the development of Buddhism characterised by the assimilation Hindu influences and popular cults. The cult of the guardian gods became an integral part of Sinhalese Buddhism. Separate shrines dedicated to the guardian gods were accommodated in the architectural scheme of the temple and provision was made for conducting worship regularly at these shrines. Moreover, it is significant that in the imprecatory portions of royal grants the four guardian gods, namely, Upulvan, Saman, Vibhisana and Kanta-Kumara, are mentioned along with the triratna and the gods Mahesvara, Visnu and other gods as objects of veneration. The cult of Skanda became popular in the 15th and 16th centuries when several temples dedicated to him were established in the central and south-western parts of the country. The fact that Skanda came to be referred to as Kataragama Deviyo during the period of the Kantaiyan kingdom suggests that Kataragama was identified as the centre of his cult just as Devinuvara was in respect of Upulvan. Kataragama as the focal point of interaction between two religious traditions has a two-fold aspect. In the Buddhist perception the shrine at Kataragama is the shrine of Kanta-Kumara, one of the four guardian gods of Lanka whereas to the Hindus he is Skanda-Murukan, a manifestation of the omnipotent and transcendent Divinity. 1. Ponnambalam Arunachalam. "The Worship of Muruka or Skanda". In Studies And Translations Philosophical and Religious, 1937. Colombo: Department of Hindu Affairs, Ministry of Regional Development, 1981 (p. 117). 2. Paranavitana, S. History of Ceylon Vol. 1 Pt. II. Colombo: University of Ceylon Press, 1960 (p. 764). 3. From Rebeiro's description it is clear that the shrine of Skanda which the Portuguese soldiers were looking for was on the top of a hill. It would appear that they were going round Katiramalai. Ameresekera, H.E. "The Kataragama God, Shrines and Legends". Ceylon Literary Register (Third Series) vol. I, No. 7 (1931): 353-357. 4. The salt-pans are referred to here as lewayas. Ibid. 5. Dr. Davy was a physician in the army during the Governorship of Robert Brownrigg. His account of Kataragama is based on personal observations made during a tour of the southern part of the island. Herbert White, Manual of the Province of Uva, HC. Cottle, Acting Government Printer, 1873, pp. 38-43. 6. The Kalyanamatam is said to have belonged originally to Kalyankiri, a mendicant who was associated with the order of Dasanamis affiliated to the Srngeri pitham. He had gone on a pilgrimage to Kataragama and eventually became a resident of the locality. 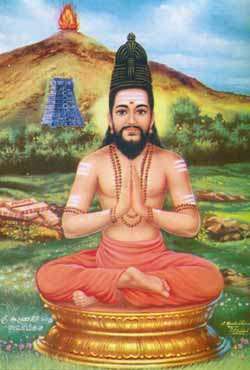 According to a tradition he established the shrines of Teyvayanai amman and Valli-amman and renovated the devale of the God. Besides, he is credited with having restored the worship at the premises of the temple Vakumaracuvami, "Katirkama ksettirac Cirappu", (pp. 17-67), Katiramalaip pallu, ed. V. Coomaraswamy. Madras: printed by C.V. Jambulingam Pillai at the Progressive Printers, 1935 (pp. 40-43). 7. Dr. Davy says: "The village of Kataragama is situated at the south-east of the Island, on the left bank of the Manik-ganga, at a distance of more than 40 miles north-east of Hambantota, and about 60 miles south-east of Badulla. It has a road practicable for carts from the former." "The population of the village may be estimated at forty including men, women and children; but it is liable to fluctuation from the influx and efflux of the pilgrims who resort to the temple. And I need not scarcely add that the village, its adjacent hills, and the surrounding country, are all temple lands, and their occupants are attached to the temple service as its tenants." op. cit. Manual of Uva, p. 47. 8. "During the fortnight of the festival, however, crowds of pilgrims, not only from all districts of Ceylon, but from distinct parts of India, and occasionally some even from Kashmir, flock to the place," Ibid., p. 42. Kesapuri Swami and Surajpuri Swami were two holy men who had gone to Kataragama from India to become permanent residents attached on the shrines there. Both of them were known to Ponnambalam Arunachalam. He says: "An old Brahmin hermit whom I knew well, Śrī Kesopur Swami, was for about three quarters of a century a revered figure at Kataragama. He had come there as a boy from a monastery in Allahabad in North India in the twenties of the last century. He attached himself to the Hindu foundation (next to the principal shrine) of Teyvayanai amman temple and monastery. This institution belongs to a section of the Dasanami order of monks founded by the great Sankaracharya of Srngeri Matam (Karnataka). The lad after a time betook himself to the forest, where he lived alone for years, until he was sought out and resorted to human society by a young monk, Surajpuri Swami by name, whom also I knew. The latter was a beautiful character, pious and learned, and with a splendid physique. He had been a cavalry officer of the Maharaja of Cashmere and, being resolved on a life of celibacy and poverty, found himself thwarted by his relatives who pressed him to marry and assume the duties of family life. Failing in their efforts, they brought the Maharaja's influence to bear upon him, whereupon he fled from home and traveled as a mendicant until he reached the great southern shrine of Rameswaram, well known to tourists and a great resort of pilgrims. There (he told me) he received a divine call to proceed to Śrī Pada, the "Holy Foot", which the Hindus revere as sacred to Siva and the Buddhists as sacred to the Buddha. Here he was ordered to proceed to Kataragama, where he would find a hermit in the forest whom he was to wait upon and feed with rice. This he did and brought the hermit to the temple. He soon gave up rice or other solid food and confined himself to a little milk, hence he was known as Pal Kudi Bawa. A very saintly and picturesque figure he was, revered for his childlike simplicity and purity, spiritual insight and devotion, and much sought after for his blessings. He died in Colombo in July 1898 at a ripe old age. 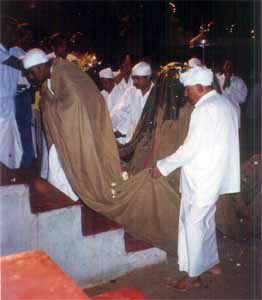 His remains were taken to Kataragama and a shrine was built over them by his devotees. His pupil Surajpuri survived him only a few months and died in November, 1898." Ponnambalam Arunachalam, Studies And Translation, pp. 120-121. 9. A number of shrines and other landmarks which were found at Kataragama in bygone days are mentioned in some verses sung by pilgrims. These were recorded by Va. Kumaracuvami, the editor of the Katiramalaip pallu, as he had heard them from Pu. Iracanayakampillai of Mavattapuram. The shrines and other landmarks are: (1) the shrine of Manikkap-pillaiyar, (2) the vilva tree, (3) the shrine of Krisna, (4) the shrine of the goddess holding the trident in one of her hands, (5) the temple of Siva and Umai, (6) the shrine of Anuman, (7) the shrine of Teyvayanai, (8) the hall named after Muttulinka cuvami, (9) the shrine of Valli, (10) the temple of Cuppiramaniyar, (11) the peak of Katiramalai and (12) the kanavar punam on that hill. 10. Pathmanathan, C. ed. Ilankaiyilulla Intukkoyilkal. Colombo: Intu camaiya kalaccara aluvalkal Tinaikkalam, 1994. 11. A temple where a deity is symbolically represented by an emblem instead of an image is known as a tiruppataikkoyil. This expression and the tradition which it denotes were in vogue in the island's eastern littoral, although not exclusively. 12. In all 29 items have been listed. Most of these are modern works and do not contain historical information. Cantana Nallalinkam, Katirkamap pirapantankal Kantalakam, Cennai, 1995, pp. 275-278. 13. Tirumuruka Kirupananta Variyar. ed. Tiruppukal Virivurai - Aram Tokuti. Vetaraniyam: Kurukulam Patippakam, 1988 (pp. 280-339). 16. Kumaracuvami, Va. ed. Katiraimalaip Pallu. Cennai: Ce. Ve. Jampulinkam Pillai, Progressive Printers, 1935. 20. Va-Kumaracuvami, "Katirkama Ksettirac Cirappu", vide. Katiramalaippallu ed. Va. Kumaracuvami, pp. 22-25. 21. Amerasekera, H.E. op. cit. No. 7 (1931), pp. 289-292. 22. Geiger, Wilhelm. tr. The Mahavamsa. London: Pali Text Society, 1964 (19: 53-55). 23. "Of the eight Bodhi-saplings one was planted at the landing-place Jambukola on the spot where the great Bodhi tree had stood ... One in Kajaragama and one in Candanagama", op. cit., 19: 60-62. 24. Ameresekere, H.E. opt. cit., (1931) p. 360. 25. Geiger Wilhelm, tr. Culavamsa Part I. Colombo: The Ceylon Government Information Department, 1953, p. 47: 12. 26. Op. cit., 47: 66-68. 27. Archaeological surveys have not been conducted systematically at Kataragama. Probably the architectural remains of buildings datable to the 11th century lay buried in the surrounding jungles. It is clear from the Culavamsa account that Kataragama was a flourishing settlement in ancient times. It seems to have been abandoned since the 13th or 14th century. It may be assumed that the temple of Skanda at Kataragama was supported by chieftains who had their seat of power at that locality during the 11th century. 28. Commenting on some of the personal names found in Brahmi inscriptions, S. Paranavitana says: "The names of Puranic gods, Baladeva, Brahma, ... Kali, Kumara (Skanda), Mahasena, Narayana are found in the following personal names: Kumara, Kumaradata, Kumaratiha, Mahasena, Suvisaka, Visaka etc. Inscriptions of Ceylon Volume I ed. S. Paranavitana, Department of Archaeology, Ceylon, 1970, p. CXXIII. 29. The names Virapperumal, Parakrama and Virabahu are traditionally associated with Skanda-Murukan. In the Tiruppukal of Arunakirinatar the God is referred to by the names Virapperumal and Parakkirama. According to the Kantapuranam, in the war against the acurar his armies were led by Viravaku-tevar. Parakrama was part of the names of several rulers of Sri Lanka since the twelfth century. Manabharana, the father of Parakramabahu I (1153-1186), had the alternate name Virapperumal. One of the younger brothers of Vijayabahu I (1055-1110) had the name Virabahu. 30. Paranavitana, S. "Lankatilaka Inscriptions." University of Ceylon Review. vol. XVIII, Nos. 1-2, p. 36. Prof. S. Pathmanathan took his PhD in South Asian social history from the London School of Oriental and African Studies in 1969. Since 1994 he has been Vice-Chairman of the University Grants Commission of Sri Lanka. He was the Secretary General of the World Hindu Conference 2003. This is a very long article. If you choose to print it out, do yourself a favor and set your print quality to 'draft', 'quick', or 'low'. If you wish to print the photos here, right click on the photo, choose 'view image', and the best thing would be to have your Epson printer inks ready and some photo paper. Please do not reprint these for anything except your own personal use unless you have the editor's permission. "Skandakumara and Kataragama: An Aspect of the Relation of Hinduism and Buddhism in Sri Lanka"